New London Reservoir was completed in 1975 as part of the Northwest Ohio Water Development Plan to provide a water supply for the Village of New London, low flow augmentation to the Vermillion River, agricultural uses, and recreation. The reservoir was built cooperatively by the Village of New London and the Ohio Department of Natural Resources and incorporates fishing devices helpful to the angler. New London Reservoir has a surface area of 220 acres at maximum water level. Its maximum depth is 35 feet in the south-central part, with an average depth of 22 feet and a storage capacity of approximately 1.4 billion gallons. The conservation pool is below the 24-foot depth and comprises 25 percent or 53 acres of the reservoir, with pool depths from 2 to 11 feet and an average depth of 7 feet. Six fishing reefs have been riprapped on their surface with 4 to 6 inch stone. These reefs range in depth from 10 to 18 feet when the reservoir is at maximum water level. Thirty-three boulder piles are located throughout the reservoir as fish shelters. These range in height from 2 1/2 feet to 6 1/2 feet and vary greatly in shape and diameter, with some reaching 50 feet in length. The boulders incorporated in these piles range in diameter from 6 inches to 3 feet. The stumpy areas with stumps extending to a height of 6 feet lie in 25 to 32 feet of water and offer coves for several species of fish. Three construction ramps were left in the reservoir and riprapped. These offer areas for spawning and feeding for the various species of fish. Largemouth and smallmouth bass, bluegills, yellow perch, walleyes, and crappies have been stocked by the Division of Wildlife. 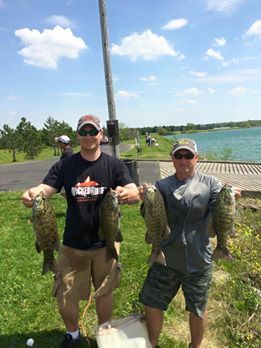 Rock bass, green sunfish, bullheads, and white suckers have been pumped into the reservoir from the Vermillion River. New London Reservoir offers a wide variety of habitat and fish concentration areas. Shallow water areas, deep water areas, cover areas, and feeding areas all serve as concentration areas for fish. Spring should produce the best fishing. Since the fishing reefs lie in fairly deep water, live bait or deep running artificials are expected to provide the best results. In the deeper areas, jig type baits such as jig spoons and ice jigs are expected to be productive for smallmouth bass, bluegills, and crappies. Smallmouths are present on all the stone surface reefs; bluegills concentrate around the boulder piles, especially in shallower water. Best baits for the bluegills are redworms or larval baits such as waxworms fished with small weighted hooks. Crappies are attracted to the cove devices also, but will usually be found throughout the reservoir. Best baits for crappies are minnows or small jigging spoons. Walleyes are present throughout the lake and usually can be taken on minnows or artificials, spinner and worm combinations are the most productive. 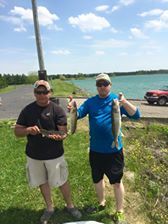 These walleye can usually be taken around the shoreline and in shallower water in the spring and by drift fishing during summer and early fall. Yellow perch may usually be taken in the same areas as the walleyes, although they utilize the cover areas such as boulder piles more. Best baits are minnows and worms. Largemouth bass are usually shoreline residents in upground reservoirs and will also inhabit the shallow water available. They are usually caught on live bait or artificial worms and baits fished along the shoreline, especially around the ramps. Ice fishing for bluegills, crappies, and perch is expected to be excellent. The two stump areas and boulder piles are expected to be the best areas, but the entire reservoir should be productive. Best baits are ice flies or spoons tipped with mousing or waxworms. Walleyes will also be taken through the ice on minnows or jigs. 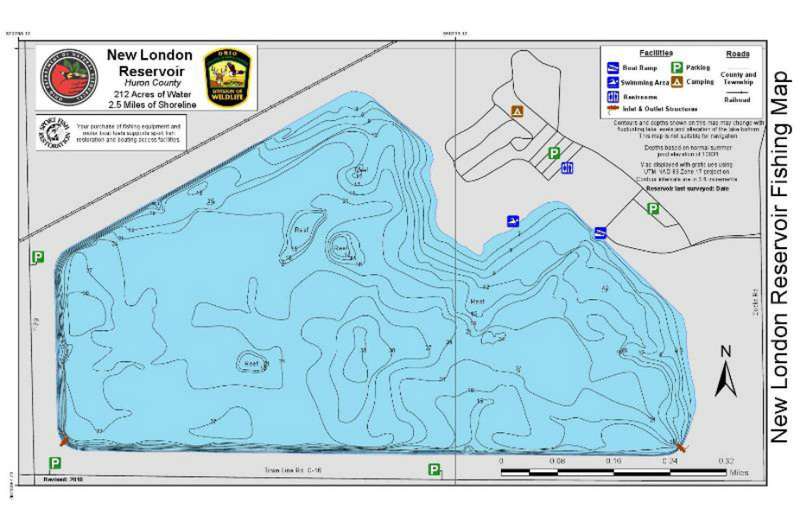 There is an electric motor only restriction on the New London Reservoir. The boat ramp, beach, and a parking area is accessible from Euclid Road, which runs north from Town Line Road. In addition, there are two parking areas in the south side of the reservoir, with another on the west side. The Division of Wildlife activities include monitoring fish populations, stocking, creel studies, and general physical and chemical water quality analysis. Fisheries research programs are also evaluating this reservoir. You MUST have a valid fishing license to fish at our facility!